Leann, one of our receptionists, woke up choking during the very early hours one morning last July. There was smoke in her bedroom. “At first I thought the smoke was coming from outside, because my window was open,” she said. But as she walked out of the bedroom, she saw thick smoke and a flickering glow at the end of the hall. Baby’s favorite sleeping spot was on top of the stove, so that’s where Leann, her owner, put her old cat’s bed. The cat bed and kitchen cabinets were in flames, and there was no sign of Baby, so Leann feared the worst had happened. By the time help arrived, the fire had gutted most of the house. What caused the catastrophic conflagration? Although it might have been faulty wiring, the firefighters felt it was more likely to be a pyromaniac pooch. Leann’s dog, Kodi, has a habit of standing on his hind legs and placing his front paws on the top of the stove to harass Baby. Most likely, on that fateful morning he turned on one of the burners during his hijinks. When Leann told me her sad tale the day after the fire, I realized that this type of disaster must be more common than people realize. I remembered a client who came into our office about 15 years ago with a similar tale of misfortune. One night, the family had pizza and then went to a movie. They left the pizza box, with a few uneaten pieces of savory cheesiness, sitting on top of the stove. You guessed it: The dog couldn’t resist the temptation and accidentally turned on the stove while dining. The family returned from the movie to find nearly complete destruction of their house. The dog sitting in my exam room had made a safe exit. So now I’ve personally known of two house fires caused by pets. Just how prevalent are these animal-induced infernos? My curiosity led me to the Internet. In a similar vein, a story titled “Who’s a naughty kitty…?” relates the tale of a £250,000 blaze that destroyed two houses in England. Fire investigators believe the homeowner’s tabby cats, Jesse and Dora, might have walked across a touch-sensitive knob in the kitchen, turning it on. Both cats perished inthe fire. It might seem obvious that pets and stoves can be a virulent combination. But a glass dog bowl? An article from 2009 in the Seattle Times reported that the partially-filled bowl was sitting on a wooden deck on a sunny day. The water apparently concentrated the sun’s rays like a magnifying glass. The resulting fire destroyed the deck and the adjacent kitchen to the tune of $215,000. University of Washington atmospheric scientist Steve Warren says the dog-bowl theory sounds far-fetched but not impossible. Extinguish open flames. Pets are curious and will investigate cooking appliances, candles, even a fire in your fireplace. Make sure your pet is not left unattended around an open flame, and thoroughly extinguish any open flame before leaving your home. Remove stove knobs. Remove stove knobs or protect them with covers before leaving the house. 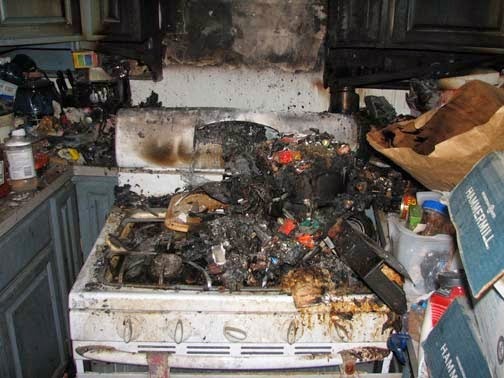 According to the National Fire Protection Association, a stove or cook top is the No. 1 piece of equipment involved in fires started by pets. Invest in flameless candles. They contain a light bulb rather than an open flame, eliminating the risk if your pet knocks it over. Cats are notorious for starting fires when their tails turn over lit candles. Beware of water bowls on wooden decks! · Keep Pets Near Entrances When Away From Home. Keep collars on pets and leashes at the ready in case firefighters need to rescue your pet. When leaving pets home alone, keep them in areas or rooms near entrances where firefighters can easily find them. · Secure Young Pets. Especially with young puppies, keep them confined away from potential fire-starting hazards when you are away from home. Secure them in a crate, or erect baby gates. · Because pets left alone can’t escape a burning home – Consider using monitored smoke detectors that are connected to a monitoring center so emergency responders can be contacted when you’re not home. Such systems provide an added layer of protection beyond battery-operated smoke alarms. · Affix a pet-alert window cling – Write down the number of pets inside your house and attach the static cling to a front window. That critical information saves rescuers time when locating your pets. Make sure to update the number of pets listed. Although Leann and her husband had to live in a hotel room and farm out their pets for five months, her story has a happy ending: All 12 pets were safe. Needless to say, Baby no longer sleeps on the stove, and the stove knobs are protected from Kodi with child-proof covers! Grain-free diets: Wholesome or hype? All of us who own dogs or cats have walked the pet food aisle, searching for the highest-quality food within our budget. We’re attracted by a product’s appearance and by the claims on the label. I don’t know about the rest of you, but even as a veterinarian, I can get a little perplexed. Organic, holistic, all natural, premium, human grade — what do those really mean? To add to the befuddlement, over the past few years it’s been hard to ignore the latest category in the pet food aisle: grain free (hereafter called GF, not to be confused with gluten free). The phrase alone evokes the idea that grain must be harmful. But for years, dogs and cats have thrived on pet foods containing grain. So what’s the deal here? Pet food companies are making claims about GF diets to appeal to consumers. They claim that GF food more closely mimics a dog’s or cat’s natural ancestral diet, lessens the risk of food allergy, contains more meat-based protein, is easier to digest and is lower in carbohydrates compared with food containing grains. I decided to ignore the spin and talk to a real expert, so I called Hill’s veterinary division and spoke to one of their board-certified veterinary nutritionists. I noticed that Hill’s Science Diet division also offers GF alternatives, and I asked the doctor why they developed them. She acknowledged that the GF food isn’t necessarily better but said that Hill's had to offer it to compete with the glut of similar foods on the market. If pet food manufacturers don’t use grain as a carbohydrate source, just what do they use? Hill’s uses potatoes, but other popular grain replacements include sweet potatoes, beans, lentils, tapioca, and quinoa. So far, that sounded pretty good to me! But the doctor explained that some of the carbohydrate replacements are actually less nutritious than the grain they replace. A good example is white potatoes, which are carbs of dubious nutritional value for dogs and cats. Okay, maybe GF food isn't necessarily more nutritious, but wouldn't its lower carb content be beneficial? First, it turns out that not all GF foods are lower in carbs than their grain-containing counterparts. And second, even if they were, the idea that carbs are bad for dogs and cats seems to be an offshoot of the wildly popular (and scientifically unsound) human diet fads on the market, such as the Grain Belly and Paleo diets. Perhaps better digestibility is an asset? Nope: The Hill’s veterinarian said it's not universally true that GF food is more digestible; it depends on the food and the individual pet. What about the idea that it's less allergenic? Again, it ain’t necessarily so. Most food allergies (which are really less common than most pet owners think) are from the animal protein, not the grain. You might think that I’m anti-GF food, but I’m not. Certain dog breeds, such as soft coated wheaten terriers, are prone to serious gluten intolerance, so a diet free of wheat and other grains (which may be contaminated with wheat) is essential. 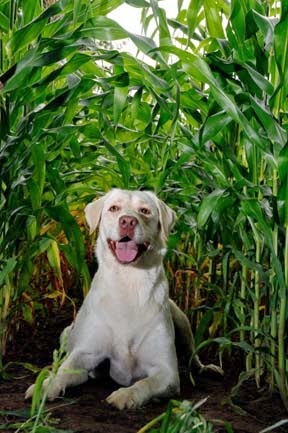 Just as in humans, grain intolerance exists and can cause bloating and diarrhea. In our practice, when a dog or cat has digestive problems, a GF diet is one of the weapons in our armory. Some itchy dogs do better on GF diets, although in my experience, that doesn’t happen often. If you find a particular GF diet that your pet loves, there’s nothing wrong with putting it on his menu. But if you have a couch potato or senior pet, GF food could cause weight gain and constipation. Because the benefits of GF food really depend on the individual dog or cat, our job as veterinarians is to help you decide whether it's ideal for your pet. The bottom line: Although GF food can be the subject of exaggerated claims, it can also be tasty and useful for your pet. So let’s call it somewhat legitimate hoopla! ‘Just’ a hairball? Maybe not. Many cat owners are all too familiar with that scenario. In fact, most of you probably jump into a practiced drill when you hear the dreaded hacking noise. Mine is to grab the offending cat and try to make it to the shower in time. But a recent article in Journal of the American Veterinary Association (JAVMA) reported that vomiting from hairballs is neither as normal nor as benign as we once thought. In fact, it said that a cat’s frequent hairball vomiting should be a wake-up call to the veterinarian to dig deeper for the real cause. It’s true that treatments such as sensitive-stomach diets, hairball medicine and anti-vomiting drugs may improve symptoms. But the relief may be incomplete or short-lived. 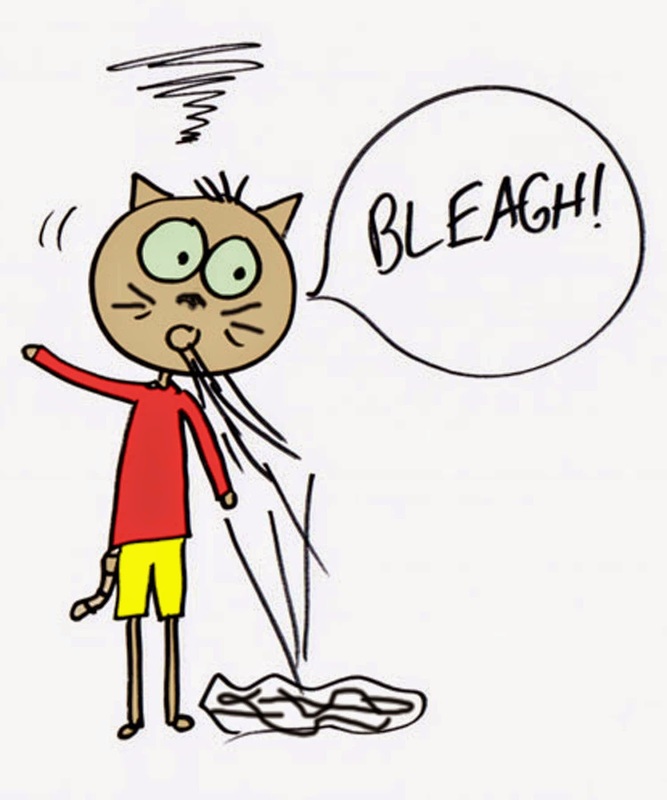 The JAVMA article described a study involving 100 cats that exhibited chronic vomiting. Researchers performed biopsies on abnormal-looking areas in the cats’ intestines. What they found was mind-blowing: Of the 100 cats, one was in normal health, 50 had cancer of the gastrointestinal tract, and 49 had enteritis (an inflamed GI tract). The finding of enteritis is important because without treatment, the condition can progress to cancer. This was a select group of cats, notable for their frequent vomiting. Still, the study holds a lesson for us doctors and our cat-owning clients: It’s time to take hairball vomiting more seriously. If you have a frequent puker and brief symptomatic therapy doesn’t solve the problem, get a diagnosis. You might be able to prevent a minor annoyance from turning into a serious problem. Ever wonder how your cat sees you? I tossed the sock into the next room, clicked on the link and, true to the title, I was surprised. 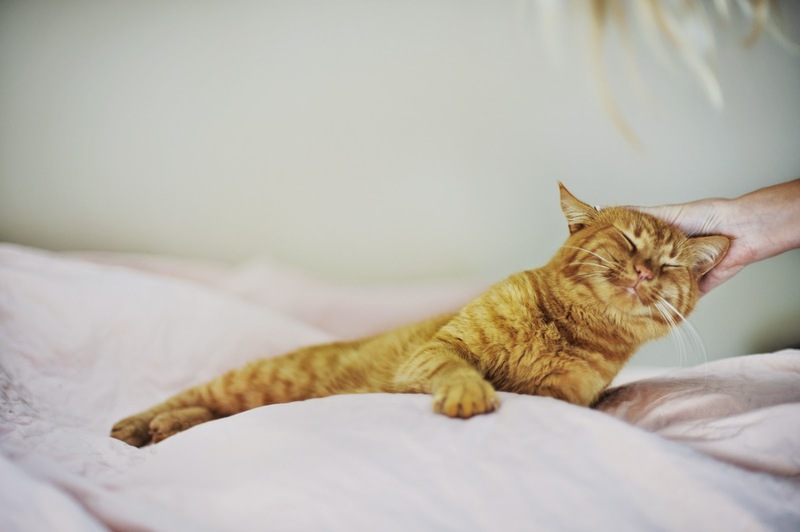 The researcher (and author of the book "Cat Sense") is John Bradshaw, a cat behavior expert at the University of Bristol in the United Kingdom. Bradshaw says that although dogs recognize us as a different species and treat us accordingly, cats don’t seem to understand that we’re not, well, other cats. Bradshaw has observed that as soon as dogs see their owners, they change their behavior. The way they play with people is nothing like the way they play with each other. But cats, he says, are different: All that head bumping, wrapping around our legs and grooming us is exactly what cats do to each other. To some extent, I agree with this expert. My two cats do sometimes treat me like another cat, especially when they nip my toe and run away because they aren’t getting the attention they want. Brats! They pick on each other in very similar ways. But I wonder if Mr. Bradshaw has any personal cats at home. If he does, maybe they don’t display some of the behaviors that, to me, seem like unique cat-to-human interaction. For example, the sock Cam just dropped in my lap. I’ve never seen either cat take a toy to the other and drop it in front of him. Cam loves to play, and he meows loudly and pounds relentlessly on the drawer where his toys are kept. He’ll interrupt that behavior by jumping into my lap and staring at me until I make eye contact; then it’s back to the meowing and thumping. He doesn’t run to his brother and ask him to open the drawer. He knows I’m the toy guy. Ditto for food. They both know I’m the food guy. In addition to carefully observing cat-to-human behavior, Bradshaw spent many hours watching the interaction among groups of cats. His research led him to one conclusion that I’ve been harping on to my clients for many years: Cats are sociable, but not to the degree dogs are. Although many dogs enjoy being around other dogs, cats might not care for company as much as their owners think they do. So before you run out and bring home another cat, remember that your cat already has one or more big, clumsy pseudo-cats in its environment: us. And we may be enough.